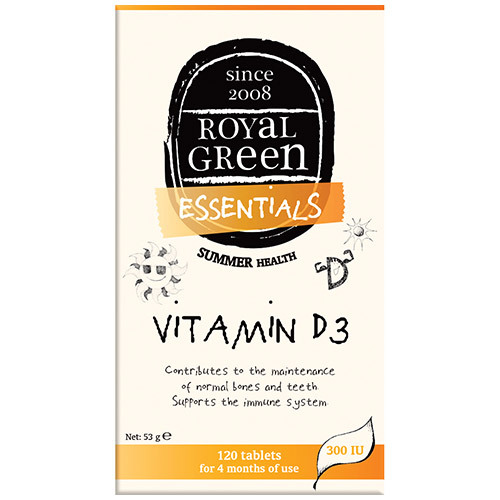 Royal Green Vitamin D3 is a handy vitamin that helps in the development and maintenance of healthy teeth and bones as well as supporting the immune system, brain function and mood. With 300iu of Vitamin D3 per tablet, Royal Green Vitamin D3 is packed with goodness. It is particularly recommended for elderly people to take additional vitamin D.
Inulin, firming agent (acacia gum), maltodextrin, sweet potato powder, anti-caking agent (beeswax), Vitamin D3 (Cholecalciferol). Below are reviews of Royal Green Vitamin D3 - 300iu x 120 Tablets - Best before date is 30th June 2019 by bodykind customers. If you have tried this product we'd love to hear what you think so please leave a review.